Last January, Denny Heck ’73 (D-Wash.) was sworn in as the first U.S. Representative for Washington’s newly created 10th Congressional District, anchored around Olympia. He won the seat after losing his previous bid for Congress in 2010, when the more southerly 3rd Congressional District still included the city. Heck’s public service career stretches back to 1976, when he was elected at age 24 to the first of his five terms in the state House. Twenty years ago, he co-founded the state’s public affairs network, TVW. When he’s not in the other Washington, working with the 113th Congress, he’s back in his home state. We caught up with Rep. Heck in September at the Olympia Farmers Market, where he held a “Congress At Your Corner” meeting to speak directly with constituents about the issues of most concern to them. What do you hope to accomplish in Congress? I hope to be a part of putting policies into place that expand economic growth and opportunity. Our nation’s economy is growing too slowly right now. We can do better. What’s your philosophy about government and being a representative of the 10th District? I believe government has an important role to play in the growth of a socially- and economically-just society. I believe my role as a member of Congress is to advance those goals to the degree I am able to. U.S. Congressman Denny Heck ’73 listens to his constituents’ concerns during a September meeting at the Olympia Farmers Market. Heck credits Evergreen with helping him develop critical thinking, communication skills and resourcefulness. What have you discovered about Congress since you were sworn in? I knew before I got to Congress that it had become an incredibly dysfunctional place. However, I believe I may have underestimated just how dysfunctional it really is. For the sake of our civic health, that has got to change. What challenges have you faced since being elected? I think the biggest challenge is getting past the disproportionate influence the Tea Party has in Congress. Though only a minority of Members of Congress identify as Tea Party members, they have the ability to muck up the works to an incredible degree, even on matters that had previously been uncontroversial, bipartisan issues. What’s been your high point since serving? Several possibilities come to mind, but my high point has probably been seeing President Obama sign my first bill into law in the Oval Office earlier this year. [The bill, cosponsored by Congressman Mike Fitzpatrick (R-PA), gave the Federal Housing Administration authority to quickly make common sense reforms to the federal reverse mortgage program necessary to stabilize it. It was signed into law in August.] Low point? The first 90 days were a difficult personal adjustment because of the frequency of being apart from my wife, Paula, who still lives at home in Olympia full time. But we’ve managed to adjust. What are your constituents saying/asking for at your recess public meetings around the district? The August recess was at the height of the debate around taking military action against the government of Syria. A lot of constituents expressed understandable concern about such action. It appears that military action is off the table for now, however, and I think everyone is hopeful the diplomatic path that the Obama Administration is pursuing will be successful. What made you decide to run again in 2012? Like anyone who decides to run for public office, I felt I had something to offer as a public servant. My immediate motivation was concern about the lack of economic opportunity and growth in the United States in the wake of the 2008 financial crisis. 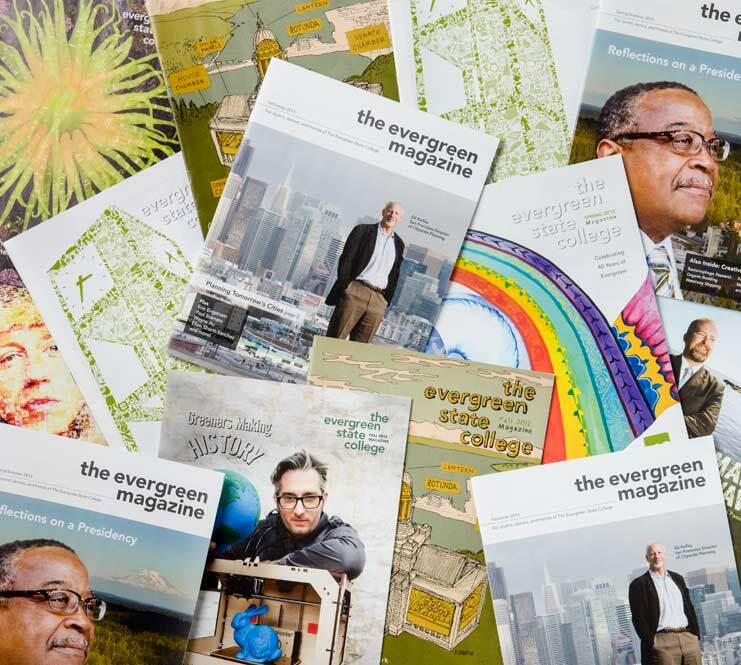 What did you study at Evergreen? It was a very broad-based liberal arts education, covering everything from biology to political science to labor history. What did you learn at Evergreen that helped to transform/ influence your life? Critical thinking, good communication skills, resourcefulness and the idea that I should follow my passion. Some would say I still have a ways to go on some of those fronts. What was your involvement in the founding of TVW? Why did you start the station? I co-founded TVW along with my good friend Stan Marshburn (’75, ‘88 MPA). I believe the citizens of Washington have an inherent right to watch their government at work—their government. What has changed in the political arena since you were Booth Gardner’s chief of staff and a state legislator/House majority leader? We now live in a much more politically polarized world where compromise is considered by some to be a dirty word. That makes getting things done much harder. In 2008, you wrote and produced a one-man show called “Our Times.” How did this come about and why? I’ve always loved the format of the one-person show, such as Hal Holbrook’s “Mark Twain.” Years ago, I was invited to be the coauthor of a book about transformative moments in Washington state history. I was greatly attracted to the idea but thought a one-man show would be a more appropriate and engaging medium. Writing the show proved to be easier than I thought; memorizing 90-minutes of dialogue proved to be much more difficult. My wife Paula produced it and we gave away all of the proceeds to our favorite charities. It was an amazingly gratifying experience. What’s it like being back in Olympia after living in D.C.? I come home to Olympia almost every weekend from D.C. I try my best to maintain some of the things that can provide me with a sense of normalcy. I go to book club, church, movies and plays. Olympia is very much my home, and whenever my time in public service is done, that is where I will live. I have zero interest in ever becoming a lobbyist after Congress. Zero. What are your favorite pastime activities? Reading, watching movies, seeing plays, playing cards, and hanging out with my wife, my two sons and their significant others. Advice for Greeners considering a path in politics? I had an internship in the Washington State Legislature while at Evergreen. I have no doubt it was one of the most formative experiences in my life. I’d recommend it to anyone.